We were able to show the festival directors’ favorite pictures in our last issue as a preview, and now we’re in the middle of it all: the European Month of Photography. 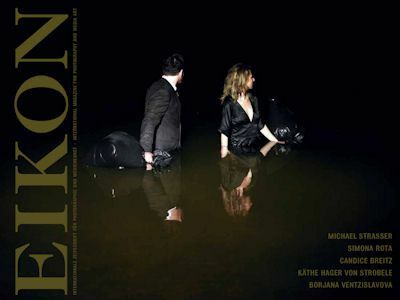 While numerous art institutions and alternative spaces around Europe present themselves as sites of photography this November, EIKON, true to its spirit, shows its favorites in this November issue. In early December, MICHAEL STRASSER will open his exhibition at EIKON’s SchAUfenster, in the Artist Pages of this issue he “tidies things up.” Strasser’s specialty lies in systematically dissecting interiors and creating new orders that develop a fascinating life of their own, using photographs as testimony of a highest aesthetic. In his most recent project, he increases the idea of making order in an immense way by disassembling an entire house by hand and systematically converting it into a gigantic block. Architecture is also the main subject of SIMONA ROTA’s photography. With the series Ostalgia on show at Architekturzentrum Wien, the Rumanian-Spanish artist draws up a typology of architectural demonstrations of power in the former Soviet republics and their successor states. In our limited Edition EIKON, we are pleased to offer the photography collectors among you two outstanding works by these two artists. Speaking of collecting: read the tips given by prominent photography collectors in our Art Market section, researched by our expert Jacqueline Nowikovsky. The artist pages continue with KÄTHE HAGER VON STROBELE’s Das Schloss, paralleling Franz Kafka’s novel fragment of the same name. Physical and psychological limits form the focus of the work of Bulgarian-Austrian artist BORJANA VENTZISLAVOVA. And in her brand-new sound installation at Vienna’s Museumsquartier CANDICE BREITZ shows to become a millionaire with the right attitude. In Forum, we present part two of our series “Aperture,” a contribution by Thomas Freiler on the rules for using photographic devices and their consequences. In addition, we have an interview with Walter Moser, the new head of the photography collection at the Albertina, and a conversation with the successful actress Katharina Strasser. Wolfgang Tillmans in Zurich, Chuck Close in Salzburg, and Daido Moriyama in London are only a few of the exhibitions featured in this issue. With all this and much more, we hope you enjoy reading the issue.